Good things come in 3’s. 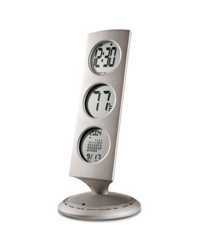 Neatly partitioned into 3 distinct viewing elements, the Three-Tier World time clock features 3 identical LCD displays featuring the time in the first region, temperature in the second and a calendar in the third. The rotating base serves as a World Dial, allowing users to scroll through 13 different predetermined time-zones of countries around the world. If only navigating across such times zones were so easy. Runs on two AAA batteries (included). This item is known in the Advertising and Premium market as the PT701 or PT 701 from its New Products exposure.